Click here for a blank order form for your church or organizaion. The bargain is not just the low price, but the high quality. Healthy. Happy. Good food for your body and your budget. Praise God - In our first year we sold nearly 3000 boxes of quality meat and fresh fruits and veggies supplied by local vendors! - Orders taken once per month - typically the third Friday with delivery on the last Saturday. Holiday season at year end may be slightly different - we'll keep you posted. 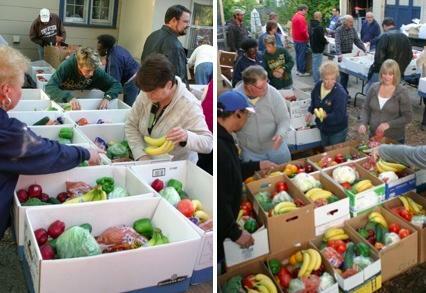 - Network churches, food pantries, and agencies to market and distribute. - Purchase with check, money order or food stamp EBT cards. FOR A COMPLETE LIST OF ORDER FORM PICK UP AND DROP OFF SITES, SCROLL TO BOTTOM OF PAGE. Click here for this month's order form. 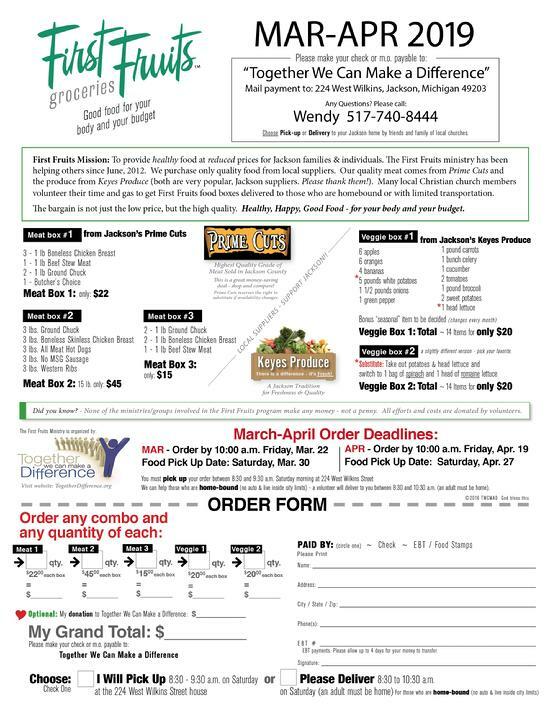 You can pick up a First Fruits order form at any of these convenient locations listed below. ALL FOOD ORDERS ARE PICKED UP FROM THE TOGETHER WE CAN MAKE A DIFFERENCE HOUSE. * Indicates a site that will also collect completed order forms for us. *Indicates a location that will also collect completed order forms for us.